Thanksgiving was such a wonderful time for our family. We traveled and visited family for the holiday. My kids got to spend some quality time with Grandma, and she just soaked up all that sweet baby love. My daughter is at that super cute baby phase. She’s started to crawl and is babbling up a storm. She’s also eating a little and exploring as many foods as we’ll put in front of her. On top of Grandmas’s wonderful cooking, my kids got to play with her dogs. They absolutely love them because they’re so adorable. She’s got the sweetest basset hound in the world, the most precious little toy Pomeranian and the cuddliest red-nose pitbull you’ve ever met. She’s actually so cuddly, it’s borderline annoying. But since we took out Coco, he kept her busy playing and running around in the yard. After Thanksgiving, we discussed Christmas. We’re planning on going skiing and staying in a cabin up north the week after Christmas. We also talked about Christmas sweets and treats we’d make for our holiday parties and for the time we’ll be spending in the cabin. Things have to be simple because we’ll be buying everything when we arrive. After talking a while, I mentioned a flourless chocolate hazelnut cake. We always have hazelnut spread, because we’re so addicted to peanut butter hazelnut spread sandwiches, we can’t get through more than a few days without one. 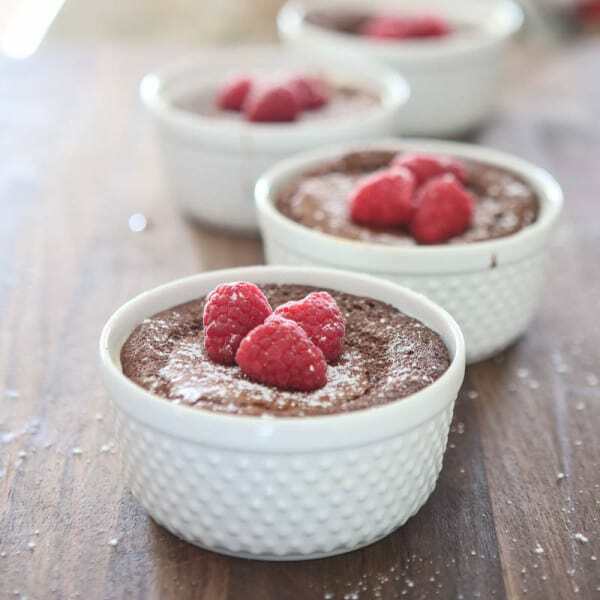 I thought this would make a perfect dessert to make for holiday parties because it’s so simple, but looks so elegant. 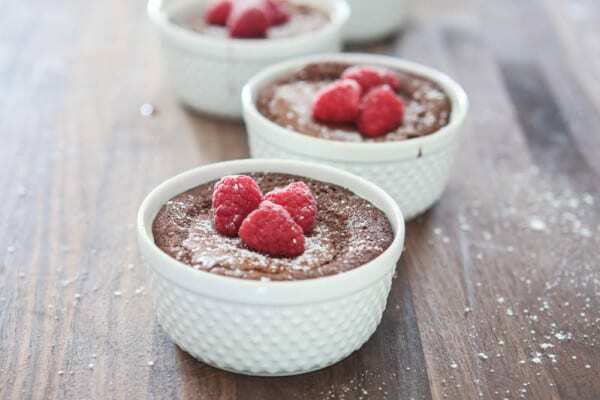 This dessert can be made in individual ramekins like I’ve done here, or one large round cake pan. I like the idea of individual small desserts better, because it’s perfectly portioned and looks super cute. To start these, I melt semi-sweet chocolate chips and butter together in the microwave. After I have that combined well, I add some chocolate hazelnut spread and sugar. After that’s combined and cooled to room temperature, I mix in the eggs. 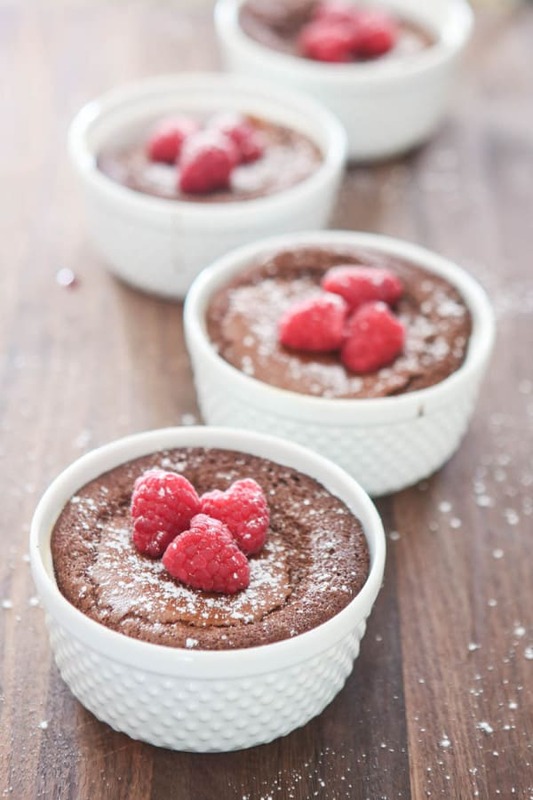 Then I just pour the batter into these little ramekins and bake them at 325° for a little over a half hour. You can let these cool completely before serving or serve them slightly warmed. I like to garnish these with fresh berries and a little powdered sugar. Ice cream or fresh whipped cream is really good on these too, especially if they’re a little warm. So good! Do you love hazelnuts as much as we do? Do you want to win $500? Enter the Falling for Hazelnuts Sweepstakes! It’s easy to enter. Just head over to the Hazelnuts from Turkey Facebook Page, like the page and click the enter now button and fill in your information. It’s as easy as that! Must be 18 years of age and a U.S. resident to enter. Contest runs now through December 30, 2015 @ 11:00 pm (US/Pacific). Click here for full rules. The texture of these cakes is close to perfect. They’re not too sweet, not too rich, and not too dense. 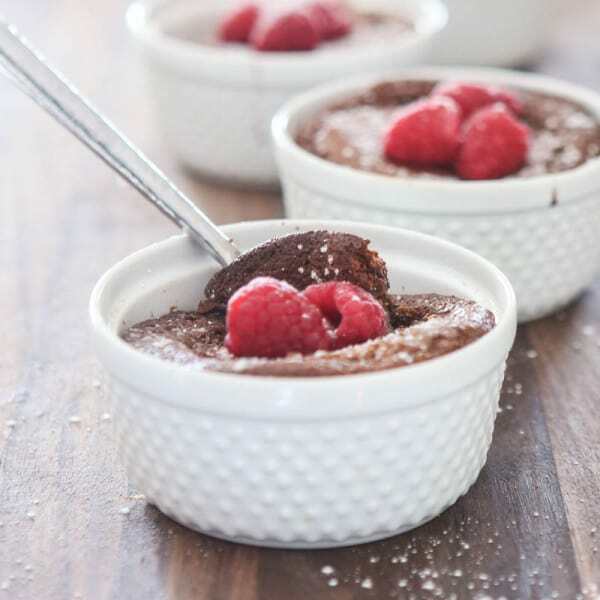 They’re a real crowd pleaser and great for your gluten free friends. Heat oven to 325°. Spray 6 ramekins with non-stick cooking spray. Combine butter and chocolate chips in a medium sized microwave safe bowl. Heat in the microwave on high, stirring every 20 - 30 seconds, until chocolate and butter have completely melted. Add hazelnut spread and sugar to bowl after chocolate. Stir well and let mixture come to room temperature. Add eggs and combine well. Pour batter evenly into 6 ramekins. Bake for 35 - 45 minutes, or until cake is set. Let cool and garnish with fresh berries and powdered sugar before serving. This post sponsored by Hazelnuts from Turkey. All options 100% mine. This cake looks like a piece of Heaven! Too bad I’m on a diet, but I’m going to prepare it for my boyfriend. This recipe looks delicious. It’s very good that it is flourless because my daughter needs to mainatin a gluten-free lifestyle. I think she will fall in love with it. I love cake and i like your way to make this cake. I really love it.